Such a cute make, love it! I love bunnies too, Bunny! What a super sweet image! Love your papers and bright, cheerful colours! 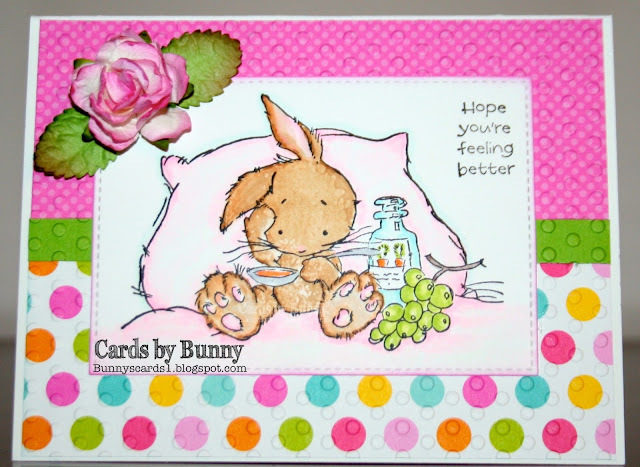 A bunny card by Bunny! Adorbs- love all the dots and the embossing too. Thanks for joining us at Crafty Gals Corner. Awww this is super cute Bunny! I love that sweet image and all that gorgeous embossing! Thank you so much for joining us this week in our Funday Friday challenge at Jo's Scrap Shack! Oh this would definitely make me feel better...it's adorable! Thanks for joining Fun~day Friday at Jo's Scrap Shack. Super cute and cheery! This project is perfect for brightening the day of someone who is under the weather! Thanks for sharing at 613 Avenue Create!